For any fledgling professional sports league, one crucial early step in development is having recognizable athletes choose it when those ‘name-brand players’ could have gone elsewhere. 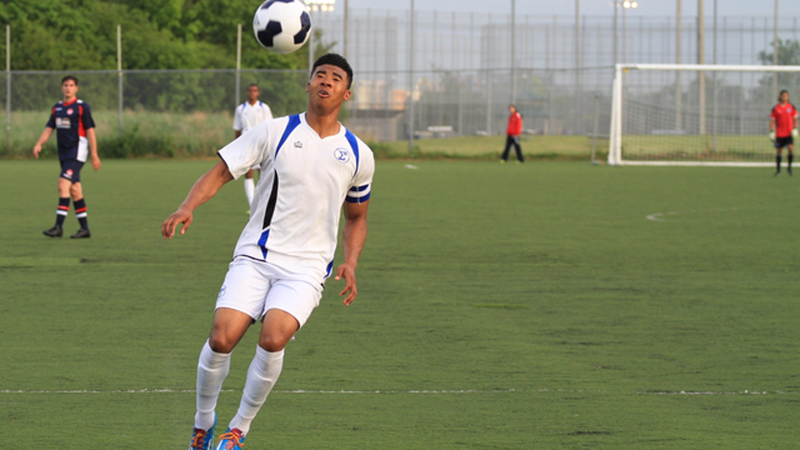 Such is the case for League1 Ontario since Emery Welshman, who was selected by Toronto F.C. 16th overall in the 2013 Major League Soccer Superdraft, signed in with Sigma F.C. following his release from the Reds. That release, which came in February 2014, has done nothing to discourage the striker, and his return to his old academy stomping grounds has given the 22 year-old a fresh perspective. “It’s definitely weird being one of the older guys now,” said Welshmen over the phone, in contrast to the fact that he was the second youngest player on TFC’s roster last year. Born and bred in Mississauga, Welshman split his college soccer career between the MAAC Conference’s Siena College Saints, and then made the move to the far more competitive PAC-12 Conference, plying his trade for the Oregon State University Beavers. He was named to the First-Team All Pac-12 team in both 2011 and 2012, utilizing his tremendous athleticism and clinical instincts; he went on to lead the prestigious conference in goals in the 2012 season. After his NCAA career was over, he moved on to score twice in twelve appearances for the Portland Timbers U23 of the USL Premier Development League, before hearing his name called by MLS commissioner Don Garber on Jan. 17, 2013. It goes without saying that it will be a day Welshman will never forget. “It was definitely the best soccer moment of my career,” he said. Welshmen officially had two appearances for TFC, first as a second-half substitute for former Wales international Robert Earnshaw at Vancouver Whitecaps on March 13, 2013. His second was as a starter in the first leg of the Voyageurs Cup semifinals vs. the Montreal Impact on April 24, 2013. But after another disastrous season, and an eye towards the rebuild that is currently paying dividends, the club waived him on Feb. 25 of this year. Enter Sigma F.C. and League1 Ontario, where he is getting a chance to keep his still fresh dreams of football professionalism afloat, and he is seizing the chance. A total of five goals in seven appearances is a fantastic early season return, while his brace against Kingston Clippers last week earned him the Player of the Week nod. “I’m not discouraged at all,” he said. A young player could be forgiven for taking some time to grieve the loss of a spot like Emery did, but according to his new coach, Bobby Smyrniotis, he has been nothing but a positive addition to his club. “It was obviously a difficult point for him when the release happened,” Smyrniotis said. Through seven matches, Sigma sits in fourth spot in the table, a mere one point below third-place Windsor and eight behind the top-holding Toronto FC Academy. Nevertheless, Sigma, like all the clubs, have had to deal with the adjustment period of the new league and competition, and Welshman is certain the Mississauga-based outfit is destined for great things. “We’ve really picked it up in recent weeks and I think we can move forward,” he said.